On Saturday, August 13, 2016, Mayni and I had the chance to take the AromaTouch Technique Certification Training, along with some very dear friends in Malmö. I had requested Elizabeth Svensson, a certified trainer, to travel from Ireland to teach our group. It was indeed a very interesting and special course! We ended up being 14 students. AromaTouch is a very specific technique developed by Dr. Hill and other essential oil experts, which uses 8 specific essential oil singles and blends to achieve a state of homeostasis, a balance between “being stressed” and “being passive”. Homeostasis is a flexible concept, which enables us to jump into the action required when something happens, and to then jump back to a balanced and centered state. I was very interested in learning about the “negative circle” our society and lifestyle tends to push us into, all of us: you get stressed, immune system gets lower (meaning you often get sick, or you even suppress sickness since you’re “too busy” and then crash as soon as you get holidays), the body produces chronic inflammation, digestive system shuts down which is another explanation to why there are so many food intolerances these days, and the whole body gets out of balance. Oh dear, that sounds much too familiar. But this technique is geared to solving precisely this issue! How exciting! Fills me with hope, this can help so many people! We spent 7 hours on training that Saturday, meaning one hour more than planned, due to some special language requirements (our group was trilingual and very international). We got first a good theoretical base of the technique, why those specific oils, what they did, and how to apply the technique. After the lunch break, in groups of 3 (a receiver, a giver and a helper) we got to practice the technique, which involves applying the oils to the back, ears and feet. We also learned how to give a hand massage. And were instructed to drink plenty of water over the following two days, since this technique triggers a detox process in the body. 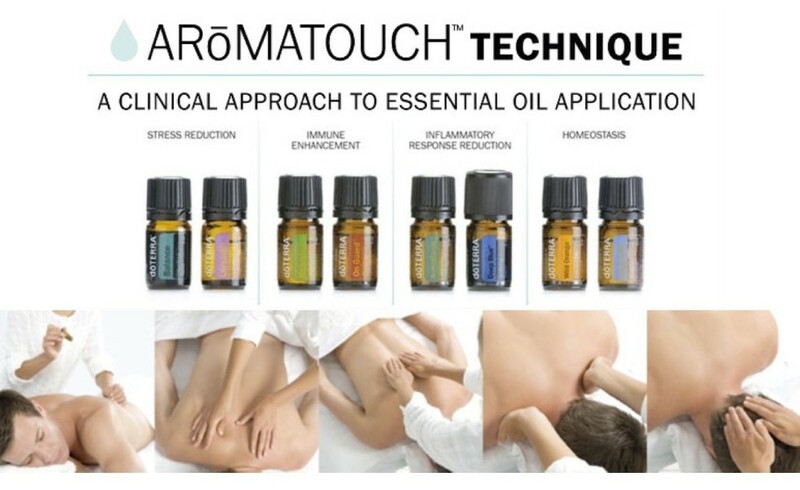 AromaTouch is not a massage, hence the name “AromaTouch Technique” (abbreviated ATT). That is, the touch that one applies is very light, more like a caress, and not a “kneading out the knots” type of massage. That makes it very simple for the giver, and not as exhausting. I am no massage therapist myself, so I really liked this fact. I was surprised at the reactions this technique caused in the room. Many of us felt a stir in our emotions, releases, feeling that healing processes were starting, some dizziness… and just as odd was that these feelings lasted just a few minutes, quickly releasing into a state of peace, calmness, wellness and mental clarity. I marveled at her explanation of the process in which the body gets out of balance. When we get stressed, the immune system destabilizes and one of two things happened: either we keep getting sick all the time, or we never get sick until holidays arrive, and as soon as we start relaxing we get sick. When the body gets ill, there is an inflammatory response which makes things worse. And often is sleep compromised, making us more irritable and worsening the cycle. The AromaTouch treatment enters to break this vicious circle with doTERRA’s Certified Pure Therapeutic Grade essential oils. With the first two oils, Lavender and Balance, we harmonize the body and alleviate stress. With the next two, Melaleuca (“tea tree”) and OnGuard, we help the immune system. The next couple is the blends AromaTouch and DeepBlue, which help regulate the inflammatory response of the body, to make it a healthier one. Finally, Wild Orange and Peppermint help the body enter a state of “homeosthasis”, that is, if there is a problem or danger we can react efficiently but quickly return to our center, without experiencing a prolonged stress effect. The oils are applied to the back, head, ears and feet. The treatment is approximately 45 minutes long and is very relaxing, while noticing the head is totally clear and alert – which in fact is a combination few of us had ever experienced before. After finalizing our practice period, we have started offering these treatments locally in the city we are at (Malmö, Extremadura, Palma de Mallorca, etc.). I find it a very valuable technique and I think that every therapist would benefit from offering it in their consultation. If you want to know more, just leave us a comment or send us an email to info@shamay.eu! In this week’s Live video I shared some of my adventures in the Stockholm interpreting trip. Enjoy!